Why Donate to the Upper Fort Garry Park? When you arrive at the Park you encounter a modern urban green space. Beneath the surface of gardens and pathways, however, another reality awaits: the design of Upper Fort Garry Provincial Park is based on the buildings, walls, and walkways of the original Fort. The setting inspires a sense of history, a curiosity to learn more about events that shaped Canada and the continent. The appearance and purpose of the original buildings and gardens are explained by means of smart-phone technology that enable you to learn the site’s history at your own pace with the aid of original photographs and brief descriptions. 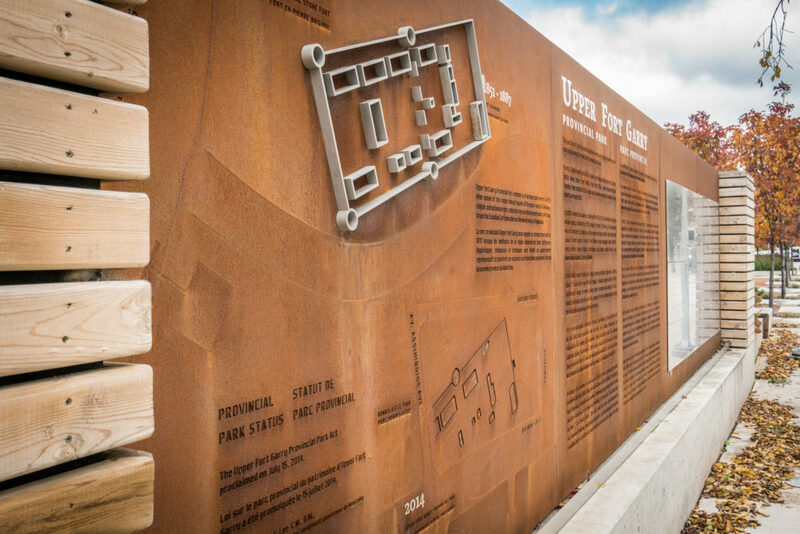 Almost every aspect of the Upper Fort Garry Heritage Park and Interpretive Centre, from the blueprints to the bricks, is a result of Manitoba-grown ingenuity. After all, who better to tell Manitoba’s story than Manitoba artists, historians, and storytellers? Every effort is being made to create a green space that Manitobans will be proud to call their own. BECAUSE OF YOU, WE ARE CREATING A FUTURE FOR UPPER FORT GARRY. OUR STORY WILL CONTINUE. THERE IS STILL MUCH MORE TO DO – BUT WE CAN DO IT, BECAUSE OF YOU!